The dispute between the UK and Scottish governments over Brexit is reaching its “endgame” with a resolution needed in days rather than weeks, Nicola Sturgeon has said. The first minister said she “genuinely hopes” an agreement can be reached over what happens to powers in devolved areas after the UK leaves the EU. She said ministers from the two sides are likely to meet next week. But she stressed that “we are not there yet” on a deal. The Scottish and Welsh governments have repeatedly branded the UK government’s EU Withdrawal Bill a “power grab” which threatens the devolution settlement, and have refused to recommend legislative consent unless it is amended. However, bills passed in the Scottish Parliament and Welsh Assembly last month aimed at providing an alternative to the legislation have now been referred to the Supreme Court, which has been asked to rule on whether they are constitutional and within devolved powers. The decision was taken by the Attorney General and the Advocate General for Scotland, the UK government’s senior law officers. Speaking as she faced questions from the conveners of Holyrood’s various committee, Ms Sturgeon expressed her “deep regret” that the issue had been referred to the Supreme Court, which she said did not help to build trust while negotiations between the governments were ongoing. But she stressed that progress was being made in the talks, adding: “It’s fair to say we are reaching the endgame of this. “We would probably over the next couple of weeks need to see this come to an agreement or not, so we are talking now more like days rather than weeks. The first minister added: “I genuinely hope we can reach agreement, but inevitably when there are pretty fundamental issues of principle involved the bar for agreement is not always easy to overcome even when lots of people on both sides are trying very hard to reach agreement. Ms Sturgeon was speaking after the UK government’s Scottish secretary, David Mundell, told BBC Scotland that he too expected negotiations to “go to the wire” as the Brexit bill reaches its final stages in the House of Lords. But he insisted that he remained confident a deal would be reached. Holyrood’s presiding officer, Ken Macintosh, has already said he believes the Scottish Parliament bill could fall foul of EU law, despite being overwhelmingly backed by MSPs last month, with only the Conservatives opposed. But Lord Advocate James Wolffe, the Scottish government’s top legal adviser, argues the bill is competent, and recently took the unusual step of making an address to MSPs to explain why. What is the Brexit bill row about? UK ministers have put forward changes to its EU Withdrawal Bill that would see the “vast majority” of the 158 EU powers in devolved areas that are currently exercised by the EU returning directly from Brussels to Edinburgh, Cardiff and Belfast rather than Westminster, which it had originally proposed. It says this will dramatically increase – rather than reduce – the powers of the Scottish Parliament. But it has named 24 devolved policy areas where it wants to retain power temporarily in the wake of Britain’s exit from the bloc, including in areas such as agriculture, fisheries, food labelling and public procurement. The Scottish and Welsh governments say they are not opposed in principle to UK-wide frameworks being established, but rejected the idea of letting UK ministers set them up without approval from Holyrood and Cardiff Bay. 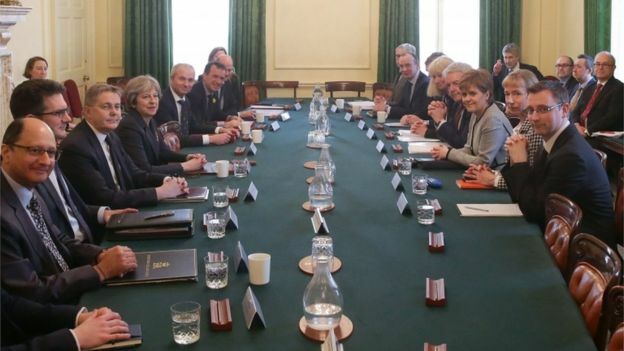 A series of talks aimed at resolving the dispute have so far failed to reach agreement – although First Minister Nicola Sturgeon recently said she believed a deal could be done after meeting the prime minister at Downing Street.